Layers can either have No Lock, Alpha Lock or Full Lock. These layers have No Lock. They can but fully edited. This layer has an Alpha Lock. Notice the lock icon is closed with a white center. With an alpha lock the alpha channel (transparency) is locked and can not be changed. This layer has a Full Lock. Notice the lock icon is closed and with a solid center. No edits can occur on this layer. Clicking the lock icon will cycle between the 3 lock modes. Here each of the layers are set with an Alpha Lock. The Paint Bucket tool was used to add a gradient to the text. 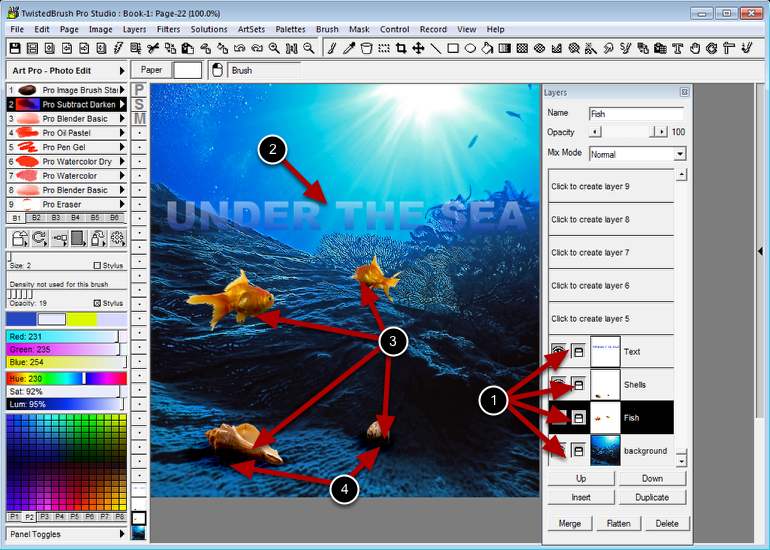 The alpha lock prevented the Paint Bucket from drawing on anything except the areas that already had image data. Shading with added to the underside of the fish and shells. Again the alpha lock prevented changes to the transparent areas. Lastly shading was added to the background layer. Note: the background layer can only either be in Alpha Lock or Full Lock modes. Here an attempt was made to paint on the background layer. However, the background layer has a Full Lock. 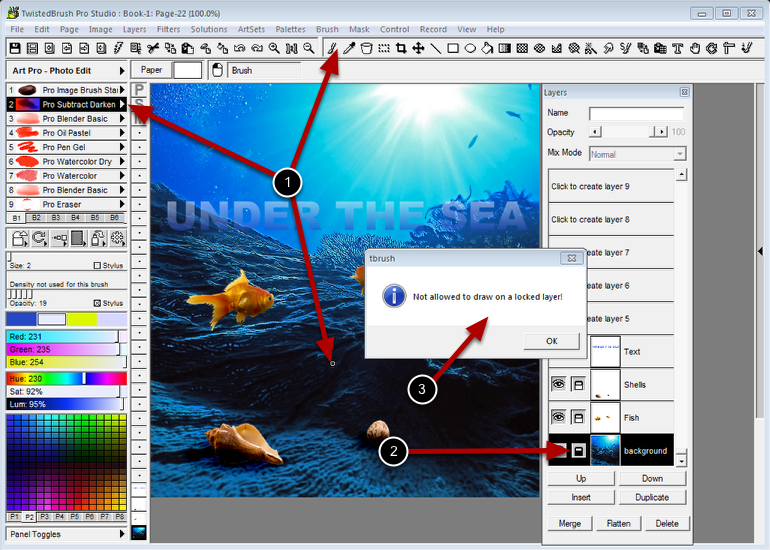 A full lock on a layer is useful to prevent accidental edits to a layer. When you attempt to edit a locked layer a notice will be displayed. Click OK to dismiss it. If you really want to edit the layer unlock it by clicking the lock icon in the Layers panel or from the Layer Mini bar popup menu.